Spinach omelette for two. Low carb and keto friendly, Fabulous. I love making this simple spinach omelette in a 6-inch pan. It's easy to assemble and ever so delicious! 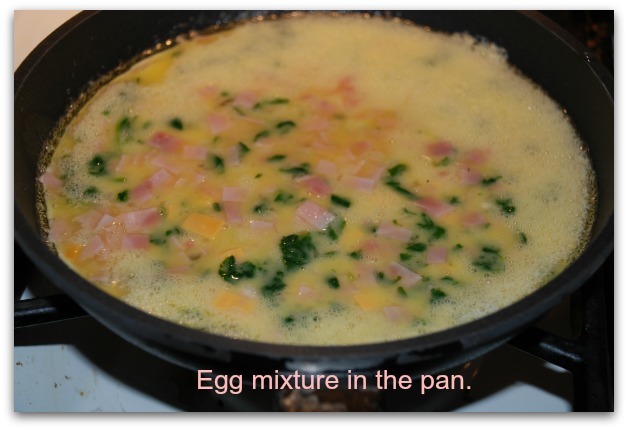 Technically it's not really an omelette, more like a frittata in a pan. Whatever it is, it's rich in flavor, fluffy and very filling. I like to make it a few times a week (I work from home so I have the luxury of a little extra time). This is a great Sunday brunch idea! If you're solo, the other half of the omelette can be re-heated the next day for a quick lunch at the office or a hurried breakfast. I like to serve this with either 1 cup of lettuce drizzled with avocado oil and apple cider vinegar. Of with a quarter of a large avocado. Trust me, you won't be hungry for quite some time. Let's do this spinach omelette thing! Rinse the spinach. With just the water clinging to the leaves, place in microwave-safe dish, cover and cook on high for 2 minutes. Allow to cool and then squeeze out all of the moisture. Chop very finely. Chop up the deli ham. Shred or finely cube the cheese. 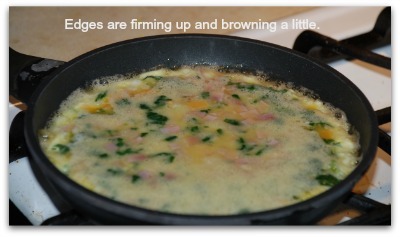 To the beaten eggs add the shallot, ham, cheese and spinach. Add salt and pepper. 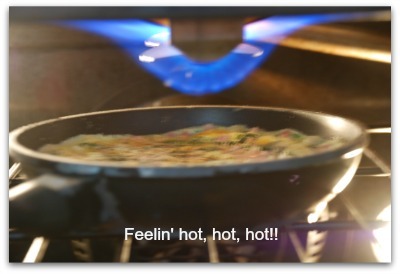 Heat the fats in a 6-inch non-stick pan over medium heat. Pour mixture into the pan. 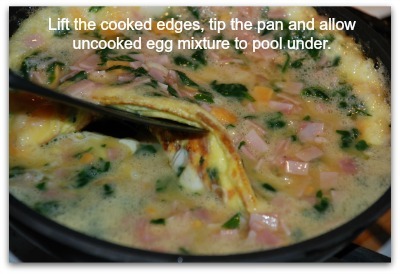 When the edges are firm enough, lift with a spatula to allow the uncooked mixture to pool under the cooked eggs. Go all the way around. Drop heat down to medium/low. 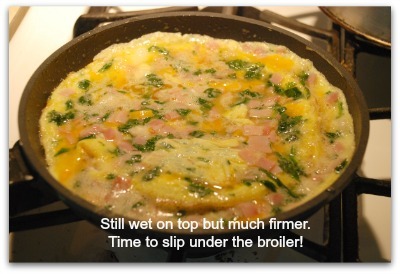 When the top gets a little firmer, place the pan under the broiler to finish cooking the eggs. The centre should feel firm. The top should be lightly browned. 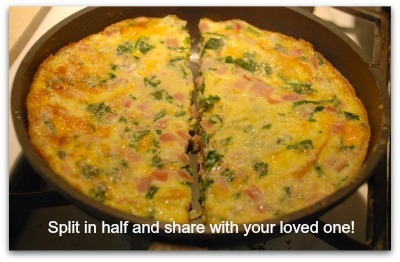 Use the spatula to cut the spinach omelette in half. Slide onto individual plates and serve with avocado or a cup of lettuce drizzled in avocado oil and apple cider vinegar. 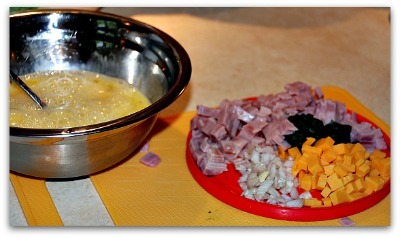 Voila, a simple omelette loaded with spinach, ham and cheese all ready for you to enjoy! 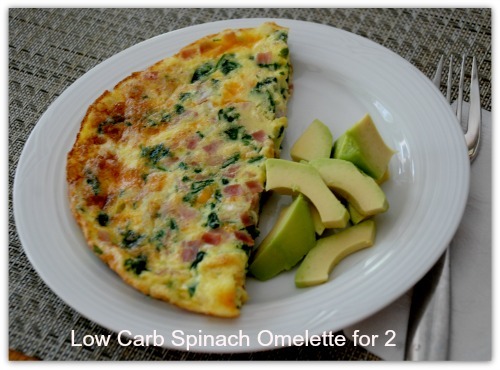 Let's go from this low carb spinach omelette back to the Home page.